The unique Mindanaoan tapestry was showcased during the search for Mr. and Miss Hannah’s Ecotourism Philippines 2017 at the Hannah’s Beach Resort and Convention Center in Barangay Balaoi, Pagudpud, Ilocos Norte. This developed as the 12 pairs of beautiful ladies and handsome gentlemen, who were the finalist to the pageant, wore these Mindanaoan clothing designs during their casual wear and formal gown attire. World’s Fashion Icon Renee Salud said these Mindanaoan clothing designs presented in the competition were his collections that were worn by the candidates of the recently concluded 65th Miss Universe beauty pageant. “My Mindanoan tapestry collections were worn by the candidates for the final round of the Mr. and Miss Hannah’s Ecotourism Philippines 2017 because I want to showcase and promote the beauty of Mindanao cultures, arts, and music in the Ilocos,” Salud said. 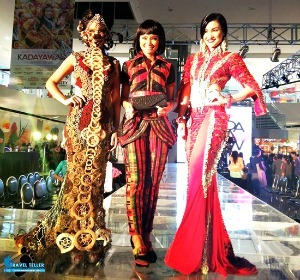 “I want to show the beauty of Mindanao weave clothing designs and styles,” he added. Now on its 5th season, Salud commended retired Air Force Colonel Ricardo L. Nolasco Jr., the owner of the Hannah’s Beach Resort and Convention Center and the founder of the ecotourism pageant, for sustaining and leveling – up the pageant to promote local cultures and environmental protection and preservation. These year’s winners were the following: Richard Angelo Adarlo from Batangas and Mikael Mendez from Tanza, Cavite, bagged the Mr and Miss Hannah’s Ecotourism Philippines 2017; Leo Lope Lofranco from Samar, and Charmaine Aller from Quezon City were 1st Runner – up; and Peter Antoni Seda from Cebu, and April Rose Alegre from Davao were 2nd Runner – up. For his part, Col. Nolasco expressed elation at the success of the 2017 Hannah’s ecotourism Philippines pageant. “This year’s search marks its entry to the big league of national beauty pageants; it steps up to take a bigger role in local and global ecotourism with Hannah’s Beach Resort being the first Philippine institution to be accredited by The International Ecotourism Society (IETS) and United NationsWorld Tourism Organization (UNWTO) in recognition of its various interventions for environmental protection and the flourishing ecotourism industry, and providing livelihood for communities,” he said. “Aside from the cash prizes received by the winners, they will become the official spokespersons of the Hannah’s Beach Resort in its promotional campaign and its advocacies of rendering corporate social responsibility projects to the communities and fostering ecotourism,” he added. Tourism Undersecretary Silvino Q. Tejada, one of the guests during the event, expressed optimism that the ecotourism pageant will help promote the tourism industry in the countryside and at the same time it promotes environmental protection and preservation.